You can use generic widgets or create custom ones. Edit the webpage where you wish to add the widget. 5. Select the widget in the "Select a widget" dropdown and copy and paste the widget code (e.g. [CONTENT:CALENDAR]) in the "Content" field. Please note that you can retreive all the widgets under the 'Widgets' tab. TIP: When designing a web page, add widgets to the side bar of your page with the Specific sidebar content box. 6. 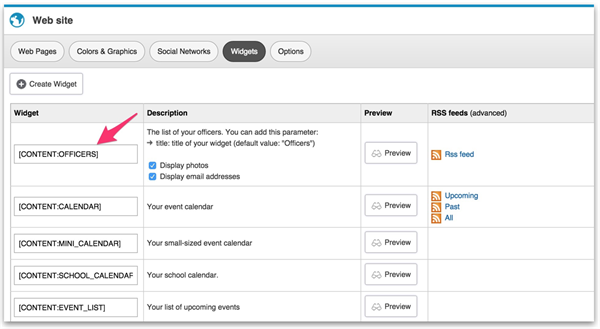 To add content and reuse it multiple times across various pages, such as content in a sidebar (e.g., application for an event or a sponsor widget), you can create custom widgets. That way you won’t need to copy and paste, nor edit, multiple times. - Cick on the “Widgets” tab and then on the “Create Widget” button. - Add options such as a title, subtitle and the content. - Click on the “Save” button.